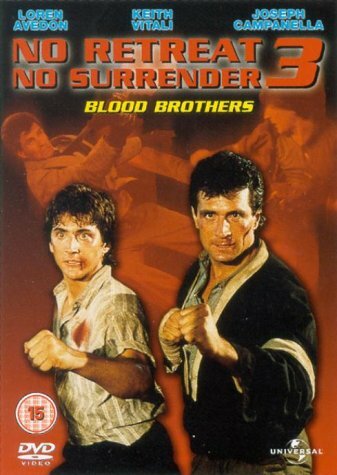 Chrichton's World: Review No Retreat, No Surrender 3: Blood Brothers (1990): The weakest in the series but still offers some martial arts goodness! Review No Retreat, No Surrender 3: Blood Brothers (1990): The weakest in the series but still offers some martial arts goodness! The third in the No Retreat, No Surrender film series without Corey Yuen involved. And it's immediately noticeable. The scale of the action and stunts is a lot smaller and the fights are less spectaculair. The acting is truly atrocious. And there barely is a plot to speak of. However there is a charm to this film that keeps it enjoyable through and through every time you watch it. Loren Avedon already proved himself to be able to carry a film. Only this time around he gets support from Keith Vitali. The two do have good chemistry but it becomes painfully obvious that Keith Vitali is not blessed with the acting gene. Now I know most of you will wonder why this is an issue for me in a martial arts flick like this. Dramatic performances and events can help make the fights and stunts more compelling and exciting. And it's not like I am expecting Shakespearean performances. However it would have been nice if both Vitali and Avedon would have sold their sorrow upon finding out their murdered father. It was very cringy. The animosity between the brothers also is not explained. Would it really have hurt the writers to come up with an event that caused the rift between them? Luckily the film does have a good villain. Rion Hunter plays Franco with much delight and he actually is believable as the bad guy even when he indulges himself to laugh like a cartoon villain. Then there is Wanda Acuna. She is ridiculously hot and certainly impresses in the small role she has. Definitely a much better actress than Vitali and Avedon. Naturally the main draw is the action. While it's not on par with the previous films it was exciting and entertaining enough. Sometimes it was a little too obvious that stunt doubles were used. Apart from that the fight choreography was quite good. Even with Corey Yuen gone it does feel more like a Hong Kong production than an American one, And I am grateful it is because that is what makes this franchise so enjoyable. Overall a must watch for martial arts fans and people who love Hong Kong movies.